Immediately after walking out of director Alexander Payne's latest, Downsizing, I wasn't sure what to think. My first thought was that it was all over the place, but in a commendable way. I think I like it, I thought. I'm still pretty sure I enjoyed it and it has been quite some time since I saw it. Everything about the film though, is designed to upend your expectations of it. Being an Alexander Payne film titled Downsizing one immediately assumes this is will be a raw human drama about a middle-aged white male losing his job and realizing his life never amounted to the ambitions of his youth while likely coming to terms with the passing of time and its fleeting nature. It would be fair to assume that, but this Downsizing is not. Rather, the consistently good yet similarly themed films of the writer/director seem to have sparked a need for a different kind of endeavor in Payne and while Downsizing still shares a number of ideas (maybe one too many, even) that have very clearly sprung from what is on Payne's mind at the moment he certainly doesn't go about conveying them in the fashion one might expect given his filmography. 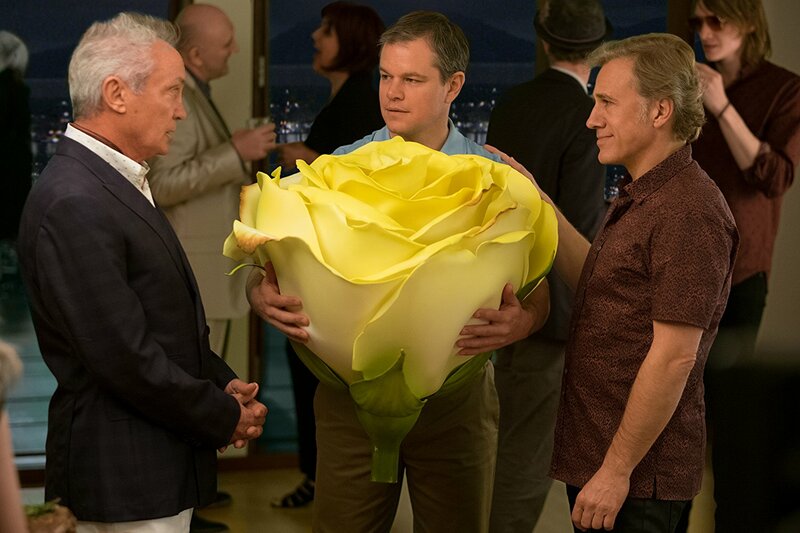 Rather, Downsizing is very much designed to be one of those sincere, but rather goofy high-concept comedies of the nineties. One where everything in the world of the movie isn't that bad for our protagonist even though they seem to be discouraged by the results of what they've become i.e. lame adults. One where the production design relates this new technological advancement to something familiar a la the microwave "ding!" that goes off each time the shrinking procedure is complete. One where the score is heavily made-up of those cheesily inspiring springs that intend to make the audience really feel the wonder of the moment at the film's main discovery (think Jurassic Park). 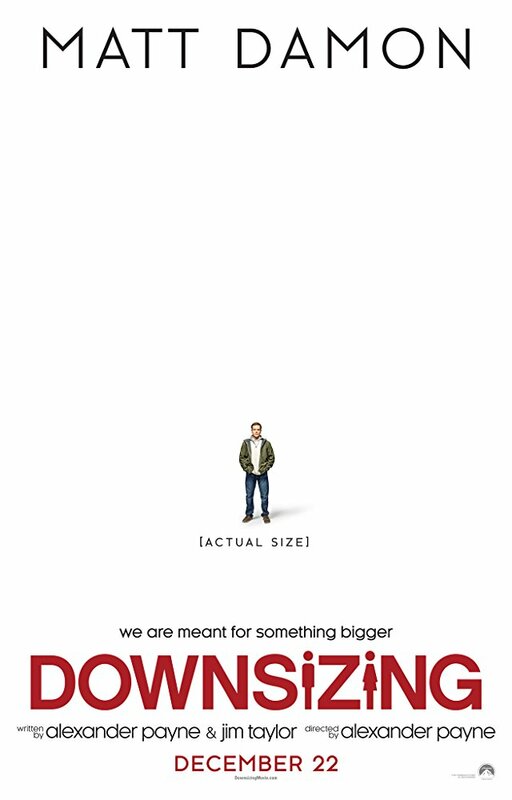 I guess, in a lot of ways, Downsizing is like Jurassic Park as it is a movie that revels in a discovery that is potentially the greatest thing since landing on the moon while also being one where man plays God; warning us of the potential dangers of technology. These advancements in both films, one being cloning dinosaurs and the other being shrinking humans, are thought of inherently as beneficial. While Downsizing ultimately seems to be for the better it doesn't shy away from the controversy that grows to surround the procedure and so, unlike Jurassic Park, Payne isn't preaching that just because we can do something doesn't mean we should. He seems to think we should. He knows we need to do something and Downsizing is a way of saying as much about saving the planet without being overly serious or hackneyed about it. Too bad it doesn't have dinosaurs though. Konrad (Udo Kier) and Dusan (Christoph Waltz) welcome their downstairs neighbor, Paul (Matt Damon), to their party. In Downsizing, we begin in Norway before venturing to Turkey as we see Dr. Jorgen Asbjørnsen (Rolf Lassgård) crack and then, five years later, show proof of his findings to the world as he's already shrunk or, excuse me, downsized himself, his wife, and thirty-four other people whose over four years of waste can now be held in less than a single average-sized trash bag. Why do this you might ask? The initial idea is the fact over-population is key to humanity's greatest issues and the multiple threats to our species that come as a result of such. Asbjørnsen describes it as "cellular reduction" and seems to hope that if everyone were to "get small" they could save their planet that is currently destined to wipe out the human race faster than it has any other intelligent species that has walked its surface. From here we travel across the globe and a few more years down the road to Omaha, Nebraska to a world where downsizing is possible and the growing pains of such a large societal transformation are very clearly being felt. We are introduced to Paul (Matt Damon) and Audrey Safranek (Kristen Wiig) who are a rather standard suburban couple whose, wait for it...reality has failed to live up with where they thought they'd be at this point in their lives. The Safranek's still live in Paul's childhood home with Paul still working as an occupational therapist given he wasn't able to finish med school as he returned home to take care of his ailing mother. It's unclear what Audrey does for work, but Wiig unfortunately plays the character as little more than a one-dimensional housewife who complains about the lack of what she doesn't have until it comes time to do something about it at which point she backs out of the deal. You see, while attending a high school reunion the Safranek's discuss with Dave (Jason Sudeikis) and Carol Johnson (Maribeth Monroe) why they decided to "downsize". While the whole deal about helping out the planet is still relevant for Paul, Dave emphasizes the more lavish aspects of the change as the value of one's money goes up exponentially allowing someone who lives on a $50,000 annual salary in the regular-sized world to live like a king once "downsized". Given Paul and Audrey have had some financial troubles in the midst of looking to buy a new house the Safranek's decide to look into "downsizing" at one of the more popular communities for small individuals knows as Leisureland. After deciding to go through with the procedure Paul comes out the other side anticipating the arrival of Audrey who never shows. Audrey has backed out at the last minute leaving Paul on his own as a five-inch man in a world he doesn't know. This sets in motion a chain of events for Paul that more or less changes his life in ways he never imagined, Christoph Waltz's Dusan and Hong Chau's Ngoc factoring largely into these reasons, but this is a change that ultimately seems to be for the better even if it is wholly unexpected. Of note is the fact Downsizing starts nearly as strong as it finishes if not muddying the waters several times in between and even in the midst of some of its best moments. The film really nails the smaller aspects of this change in society and all the factors that might need to be considered rather than neatly brushing over them thus making the first half hour of the film more layered and complex than might initially be expected. 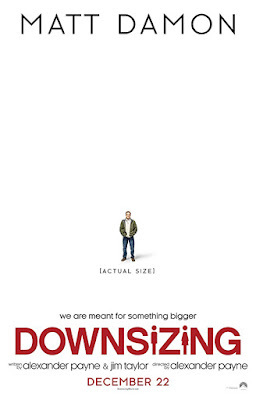 Downsizing is nothing short of ambitious, this is for sure and it is commendable that Payne would go to such lengths in order to try and convey his vision of what is otherwise a rather small-scale story. In reality, this very well could have been another Payne movie where Damon's character, who is completely serving as an audience surrogate here as he lacks anything resembling a personality, goes through a course of life-altering events only to realize these seeming blows to his routine were what would set him up for the unexpected facets of life that would instead reinvigorate his existence. This would have been simple enough and something Payne could have done without batting an eye at this point, but Downsizing instead contains a sequence in which Damon's Paul goes through this process of "getting small" and has to have all of his dental work undone, is shaven completely, and then is taken off the hospital bed as if he were a cookie on a cooking sheet. It is far and away the most visually ambitious thing Payne has ever done and the gag as well as the consideration of how each aspect is completed is pretty great. It will be almost too easy to write off Downsizing for feeling like a movie where the story and themes the writer/director wanted to explore weren't specific enough and so, to make them more interesting, Payne and writing partner, Jim Taylor (Election, Sideways), decided to devise a social satire of sorts where they get to discuss a number of topics that include global warming, mass consumption, white privilege, and the tendency of man to revert even their freshest of fresh starts into a world of the same bad habits all without any of it feeling too heavy. It's a lot to contemplate and even more to explore in the context of a piece of art which is why Downsizing ends up being Payne's magnum opus of sorts at a lengthy two hours and fifteen minutes. This overall ambition of the project and the scope with which Payne has been able to pull this off is genuinely impressive and makes for an inspired experience on its own, but is it necessarily as groundbreaking or eye-opening as the director hoped it to be when imagining the possibilities as he crafted the script? Probably not. Still, there is plenty to like and latch onto here as I'm more inclined to be intrigued by a failed experiment than a safe retread and Payne very easily could have gone the route of the latter at this point in his career, That said, Downsizing is not a complete failure, but rather it is an inspired piece of storytelling that one won't be able to tell where it is going and will be genuinely surprised both by the lengths at which it goes in order to flesh out its ideas as well as with many of the characters and how they strike you in terms of that aforementioned tone. There are no doubt moments in the film that will determine whether Downsizing is the kind of movie one can jive with, but I was able to stick with the movie through its two most obvious examples of this and more, I liked these decisions and couldn't help but to want to know what happened next in the odyssey of Paul even if Paul is the least interesting aspect of his own story. 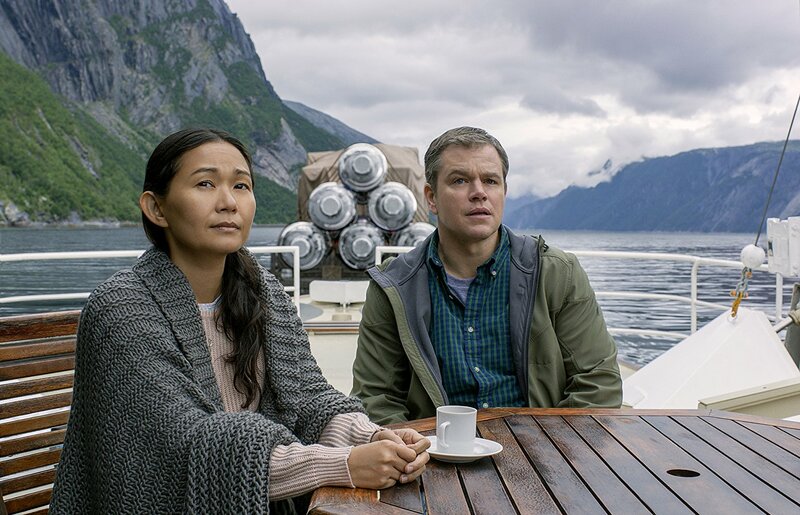 Ngoc (Hong Chau) and Paul head to Norway to visit the first colony of tiny people in Downsizing. © Â 2017 Paramount Pictures. All Rights Reserved. There is a scene early on in the film where Neil Patrick Harris and Laura Dern participate as these kinds of paid programming talking heads that sell those considering "downsizing" on the idea of it by telling them how much Dern's character paid for her diamond bracelet and matching earrings. It is a measly eighty-eight dollars or something of the like due to the facts the diamonds are so small and therefore the cost so low. This is seemingly Payne's way of reminding us that everything is about perspective. That, how we frame things is almost more important than the thing we're framing depending on how we want people to perceive it. Maybe this is why the director decided to go so big with his latest endeavor, but while it could be said that Downsizing is the least sharp of all of Payne's observations and the gimmick of shrinking exists to distract from this fact, this is still a film with a lot to say, chief among it this idea that deals in how much we're hurting the planet and our insufficient efforts to make actual change. We're doing things to make ourselves feel better, but that aren't really making change because we're not committing to larger changes that are needed for larger change. Chau's Ngoc is the stand-out when it comes to emphasizing this idea though, and she does so in spades. Ngoc is a woman who isn't sold on any preconceived notion of what she deserves or what her life was supposed to be due to the circumstances of her birth. She expects nothing and is therefore told she is strong because she has been through so much and isn't someone who openly grieves or regrets what she has encountered because she had no expectations for anything else. She takes what she is dealt and makes the best of it. She is someone as genuine as you could hope to find because she doesn't preach about what is right and what is wrong, but rather she walks the walk; doing work after work in good faith that she is making a change in these people's live who are less fortunate than she. The test with Chau's character comes with how the actor characterizes this individual. Chau's performance is so bold, so out-there, and rather broad in that it is outrageously funny (maybe even a bit too much for the tone of the film or any film), but like everything in her life, Ngoc makes the tone of Downsizing fit her own intentions and mission and not the other way around. Of course, given the film's biggest detractor up to this point was a complete lack of interesting characters it was both refreshing and enlightening to learn of this wholly unique individual. Waltz's Dusan is a fairly simple character that could be summed up in a few words, but he has some of the best lines in the movie and is generally fantastic as Waltz tends to be. Downsizing becomes the story of Ngoc though, and her dedication to making her world as painless as it can be. Ngoc is largely consumed with her humanitarian activities, but there is more to her than her survival and we see this through the relationship that develops between her and Paul lending Damon's character more complexities than he'd been able to play with prior as well. Paul is so genuine in his intentions which is funny given the film offers a rather cynical view on the human race in general, but despite the character starting out as someone who does things for the sake of making himself feel better Paul comes to learn that who he is will be the same no matter what he changes about his surroundings or his circumstances-that it is he who has to change if he wants the outlook of his life to change and it is with this arc that comes into existence once Ngoc is in the picture that not only makes Paul a more interesting character, but Downsizing a more interesting and better movie.